Click on Clients in the side menu. 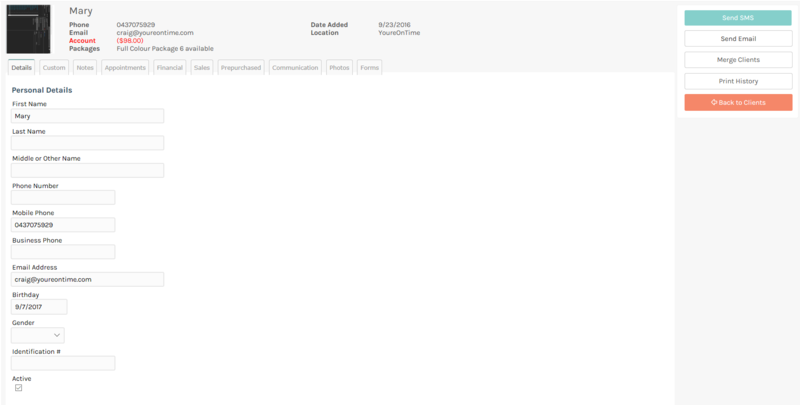 The Client Search screen will appear, displaying all your clients. Click on the Next and Previous buttons to browse your clients. You can use the search function in the top left corner. To see a client's details, click on a client record. Lets click on Mary for this example. The Details for Mary screen will appear, displaying his/her details regarding their Personal Details; Address Details; Reminders; Promotions, Labels,Account, Loyalty Points and History. Click the Client tab again to return to Client Search screen. To search for a client, simply start typing a clients name or number in the search box on the top right hand corner. For this example, lets type smi. The system will automatically search down to any matchs, in this case it has found a records for all clients with the lastname Smith. 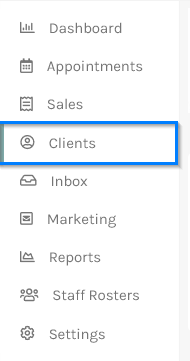 Remember that your client list will always be filtered to what is in the search box, so to display ALL clients simply do not enter anything in the search box. Now, let's add a new client.